Log into your Amazon Web Services Management Console. 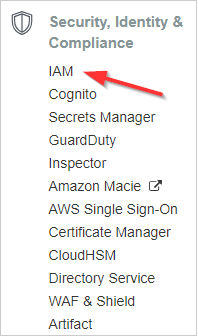 From the AWS Services screen, select Security, Identity & Compliance > IAM . From the dashboard, click Groups. Select the group that contains the user whose access and secret keys were added to CloudCheckr. Click the Attach Another Policy button. Select AWS CloudTrail Read Only Access from the list. CloudCheckr will now be able to report using your CloudTrail data. You can also use the AWS CLI to add trails for all regions in an account. Click AWS CLI for details. To enable CloudTrail for all regions within an account, use this script, which will create the CloudTrails with the name "awscloudtrail" and log into a single bucket called "mycompany-cloudtrail". You will need to use the AWS Command Line Interface (CLI) tool to run these scripts. For information on getting set up with and using the AWS CLI, review the AWS CLI documentation. You may want to create a single S3 bucket to aggregate all your CloudTrail logs from multiple AWS accounts. To do that, you can use the above script, but you will have to set the parameter "--s3-use-bucket=cloudtrail" to the name of the aggregated S3 bucket you want to use. After you configure an AWS account to write to the aggregated S3 bucket, you will need to update the bucket policy to allow CloudTrail to write into the appropriate directories in the bucket. You will need to create an entry in the policy for each of the accounts writing to the bucket. Create your complete bucket policy as shown here. Save into a file such as BucketPolicy.json. After running the above command, you will be prompted for a secret key and access key. This access key should be for the AWS account that owns the aggregated S3 bucket. You then need to run the following script. In the script, you need to point the - -bucket section to your S3 bucket and - - policy file section to the local copy of the policy file you created.